WordPress is the absolute best platform for photographers, whether you are a professional who runs a photography studio or an amateur who wishes to share their photos with friends, there is something for everyone. WordPress has many features built right into it which will aid photographers, such as rich media support, photo galleries, blogging and so on but there is also a whole Eco-system of add on products in the form of specialized themes, plugins and services for you to make use of. WordPress can have a learning curve at the beginning which can make things more difficult for you when trying to learn the ropes, but thankfully it has become easier over the years and there is now a wealth of information online which will make the learning process easier for you. We have put together this guide for Photographers who wish to get started using WordPress to create their own piece of the internet, so whether you wish to build a personal blog or magazine, business website, photo gallery or other kind of website this post should help you out. We’re going to go over which services and tools to use to do all of this. Let’s get started. Let’s talk about these in depth. Shared hosting is the cheapest of the three hosting options photographers are most likely to gravitate toward, and unfortunately, that low cost comes with lackluster features. Shared hosting servers are notorious for producing slow and unstable websites. This is because multiple websites “share” all of the space and resources that exist on the server. If one website uses up more resources than others, it’ll “steal” resources from other websites, causing them to become slow or even taking them offline entirely. VPS, or virtual private server, hosting is a step up from shared hosting. VPS environments share a lot of similarities with shared hosting environments given the fact that websites in a VPS environment share the same physical space on a server. However, websites have their own “virtual” spaces in VPS environments, so they can’t steal from another site’s resources. Sites hosted on these types of servers load more quickly, run more smoothly and are more stable as a result. Let’s take a look at cloud hosting. Just like VPS hosting is a step up from shared hosting, cloud hosting is a step up from VPS hosting. That’s due to the infrastructure a cloud hosting environment uses. The environment uses a network of machines interconnected with one another, giving your website multiple machines to use resources from. This makes your site “scalable.” This means if your site gets hit with a sudden surge in traffic, it’ll be able to draw on more resources using the additional machines it’s connected to. This website would become slow in a VPS environment, and it would likely go down in a shared hosting environment. Both of these hosts are also managed WordPress hosts, so they’re great options for photographers who lack technical skills. Need help deciding which type of host to choose and which individual host to choose? 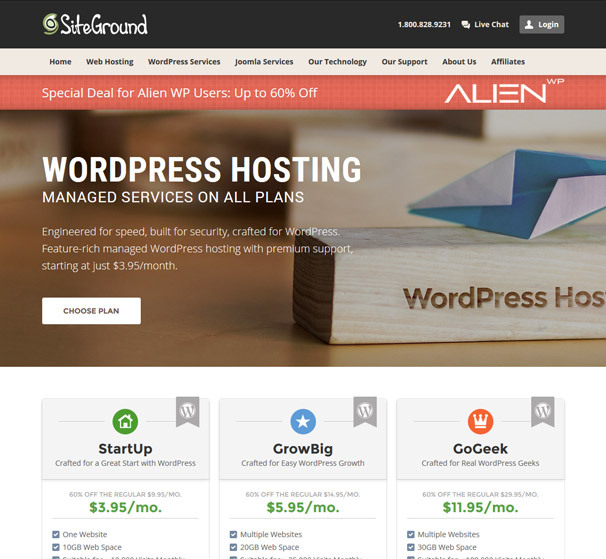 Check out our guide comparing the very best WordPress hosting options. It features everything from managed hosts to shared hosts. This post breaks down the costs and features of each host and compares them against one another, giving you enough information to make an informed and educated decision when it comes to choosing a web host for your WordPress site. Before you choose a host and signup with, check our Coupon Codes Section to get money off! 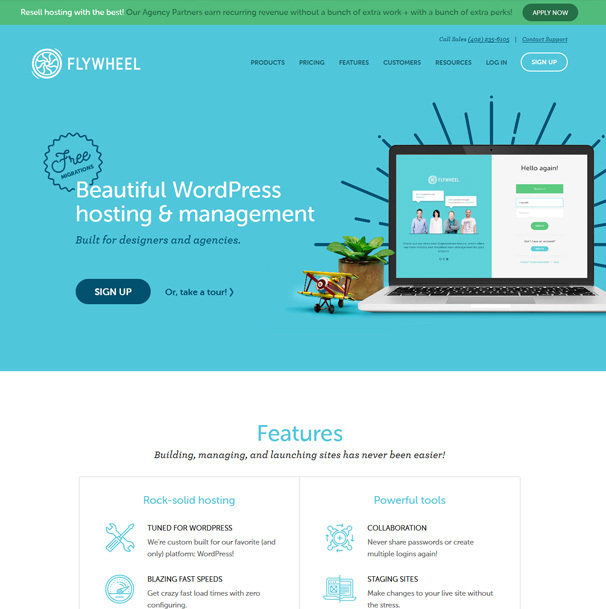 Speaking of which, let’s move on to WordPress themes as you’ll need one of these to actually build your site once you get set up with hosting. Photography WordPress themes have a specific set of features that make it suitable for photographers. The main feature these types of themes need is a portfolio to showcase the photographer’s best or most recent work. They can also use business-like features to make the themes suitable for freelancers and photography agencies, including such business-like features as calls to action and contact forms. We’re going to highlight a few photography themes we offer here at AlienWP before diving into a few theme collections we’ve compiled for photographers. 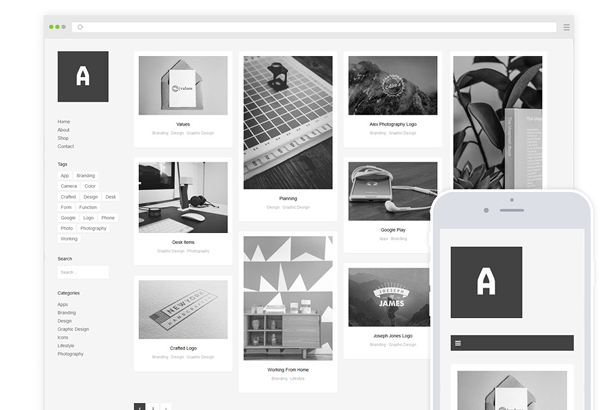 Althea is a portfolio WordPress theme, which means its primary function is to showcase your work. 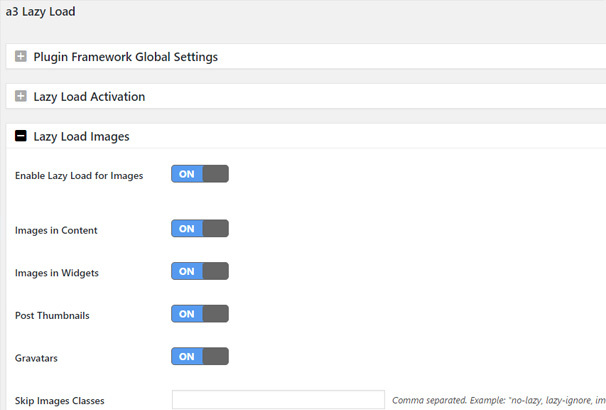 This theme uses a masonry portfolio style, which means it uses a grid layout with multiple image sizes. 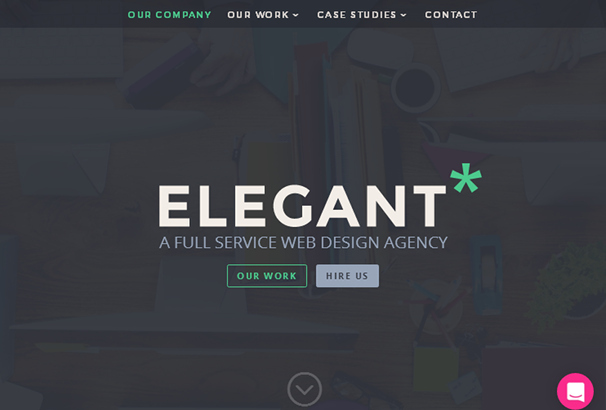 It also uses a minimalist layout, ensuring your visitor’s focus is centered on your work. 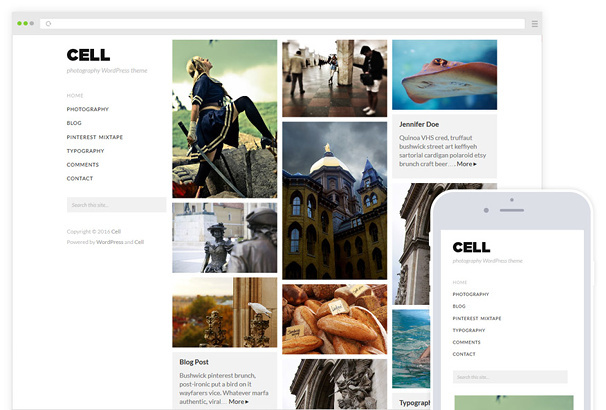 Cell is a flexible photography theme that features “photoblogging” elements. This means you can use it as a traditional portfolio theme to showcase your work but can also use it as a traditional blogging theme. Your latest blog posts will even appear in the grid layout on the homepage. 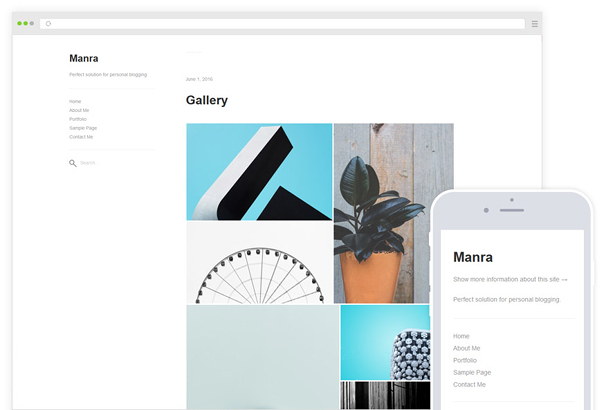 Manra is another minimalist portfolio theme. It uses a masonry grid that features thinner spaces than the previous masonry grids. This ensures your work is the most important aspect of your site as the lack of whitespace causes it to take up the majority of the page. 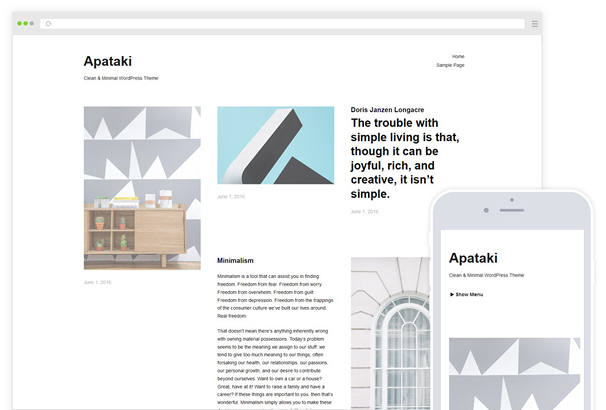 Apataki is a stylish and minimalist portfolio theme. It uses a lot of whitespace, much more than the previous themes, but this is what gives it its stylish appearance. It’s a great contender for photographers who focus on style, such as architecture or fashion photographers. 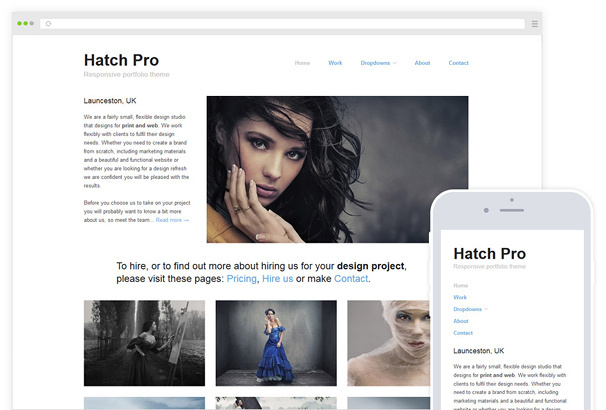 Hatch Pro is another minimalist portfolio theme, but this one differs from the rest. It uses a traditional grid layout where every image is the same size as the next. 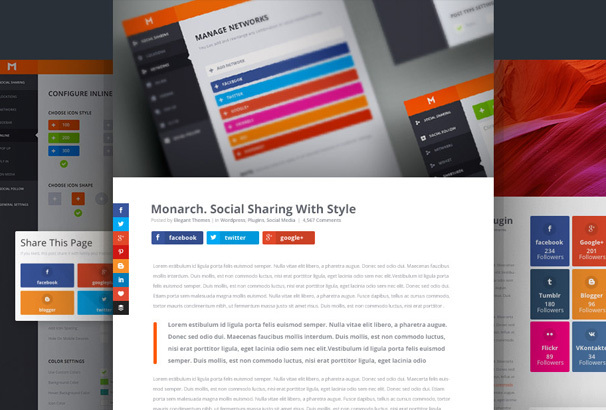 It also features a large header section you can use to showcase a single image or project. Divi is a multipurpose WordPress theme powered by the Divi Builder, a page builder plugin built by Elegant Themes. This page builder allows you to design and build your own site through simple drag-and-drop actions, negating the need to know how to code. This allows you to design your very own photography website and manipulate the look of it into whatever you need it to be. Let’s move onto WordPress plugins and a few additional features you need to consider. Let’s talk about how to handle images in WordPress, specifically how a photographer may want to handle images. For starters, you need to optimize your images for the web as much as possible. Large file sizes can increase the amount of time it takes for pages to load, and it could cause visitors, some of whom may be potential clients, to leave your site. Start inside the image editing software you use. Try to compress the image and reduce its quality as much as you’re willing to before you upload it to your site. 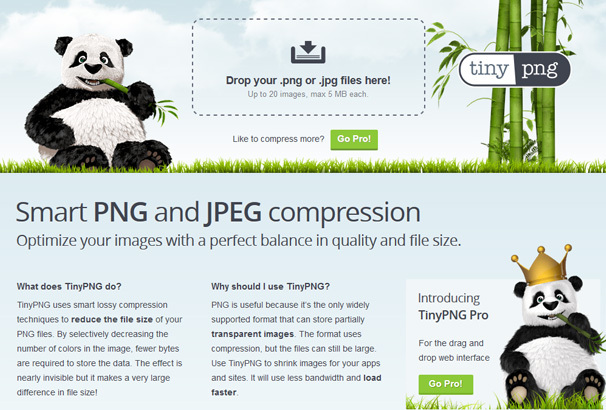 There are a few different ways you can handle image compression in and outside of the WordPress admin area. 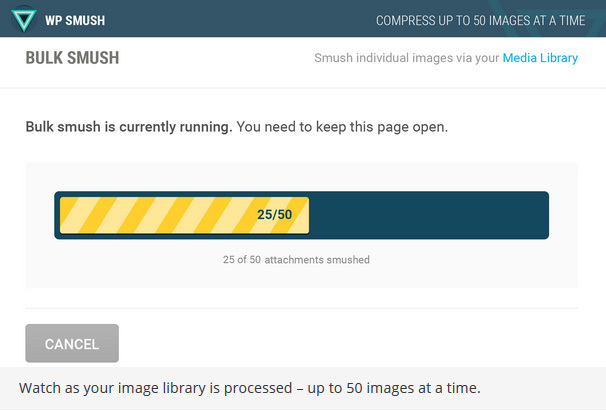 This plugin “smushes” your images for you to reduce their file sizes without reducing quality. You can set it up so it smushes images as they’re uploaded to WordPress, or you can smush them in bulk after you upload. If you don’t want to use a WordPress plugin to reduce your images’ file sizes, you can use an online service to do the same thing. Don’t get confused by the name TinyPNG. This service also compresses JPEG images. This is a must-have for photographers as photographers tend to use images with large file sizes. Uploading too many of these types of images to the server that hosts your WordPress site can cause it to become sluggish after a while. 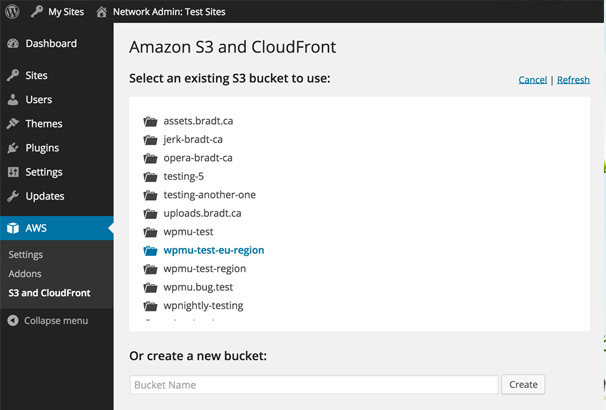 This plugin connects your site to Amazon S3, a cloud-based storage solution. 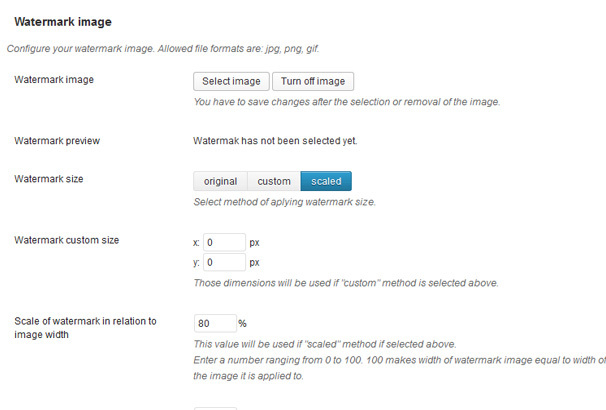 It uploads your images to Amazon S3 through the WordPress media uploader and serves them from there. You can even set it to delete the copy from your server as soon as it uploads to S3. This plugin is great for large portfolios. Lazy loading ensures your visitor only loads what’s visible on their screen. This helps page the load quicker which will improve it for your visitors and can also help in the search engines, faster sites = higher up in the search results. This plugin protects your images by allowing you to add watermarks to them, once the plugin is active it will automatically add watermarks and you can also add them in bulk to previously uploaded images. 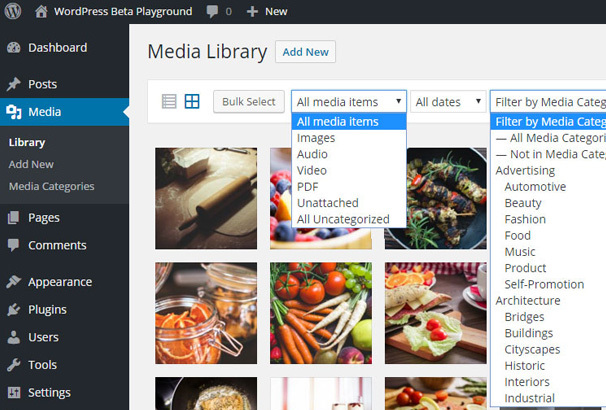 This plugin allows you to create categories for your media library so you can organize your images. Most photographer’s website will require an image gallery, you can rely on the default WordPress gallery function and whatever support for it your theme provides or you can deploy a specialist WordPress gallery plugin which will have a lot more features and display functions. There are three major social sharing plugins for WordPress that include enough features for you to add social sharing buttons to images when users hover over them.A good social media plugin will help grow your network of followers and fans and will also help to spread your content. Ideally you would like people to follow you on platforms like Facebook, Instagram, Twitter and Pinterest as these have the largest audiences suited to the photography industry. Instagram and Pinterest are visual social networks so they are perfect for photographers to use and you will have a great supply of new shots to share with your followers which in turn you can direct back to your main website to increase the traffic there, gain sales and potential freelance jobs. The two social media plugins we recommend are as follows. This is a plugin created by Elegant Themes and is a very comprehensive suite of social media tools you can use on your website. 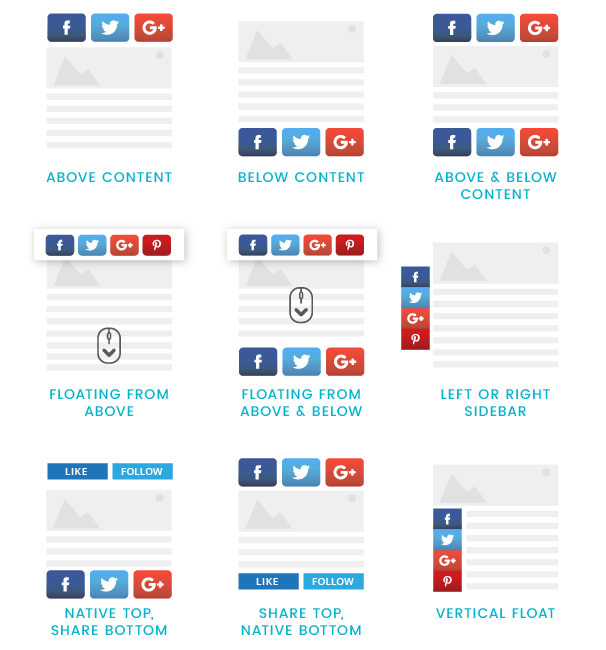 It allows you to place sharing buttons in different places around your site where they are likely to get the most engagement such as floating bars, buttons at the top and bottom of your content, slide in buttons, sidebar widgets and so on. This is the plugin we use here on AlienWP and is probably the most comprehensive and advanced social media plugin available to you. The sheer amount of features and available social networks is astounding. It has every feature and option you could ever want from a plugin of this kind so if you are looking for something very powerful but reasonably priced then we recommend you take a look. Adding social sharing buttons to your images can help you expand your outreach and “brand recognition” by encouraging visitors to share your images with their followers. Here are a few lists of essential plugins every WordPress site needs, not just photography sites. You’ll want to look into these if you’re building your own site, otherwise, have your developer take care of it. If you use one of the managed WordPress hosts mentioned above, you may not even need some of these plugins. That’s because managed WordPress hosts take care of security, caching and backups. Most don’t even allow you to install the plugins listed below. 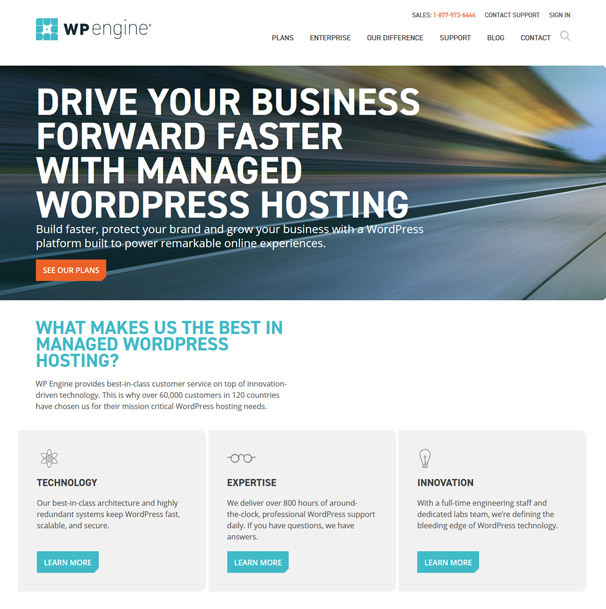 Don’t worry about researching these services if you use a managed WordPress host. They handle security for you, and some even remove malware from your site as it’s detected. They often don’t even allow Wordfence and iThemes Security to be installed. Again, managed WordPress hosts take care of backups for you, so don’t worry about researching any of these plugins if you decide to go with one of these hosts. You’ll also want to enable caching on your site. Again, your host will take care of this for you if you use a managed WordPress host. Most won’t even allow you to install caching plugins, so don’t worry about implementing this feature on your site if you decide to use a managed WordPress host. The point of a photography website is to showcase your best work and convert visitors into customers. With that said, the most important things you need to do are ensure the appearance of your site reflects the style of your images, ensure your visitors can find your calls to action and ways to contact you, and ensure it’s optimized and runs smoothly so visitors can actually use it. Cool post! Thanks for your lovely recommendation.